Government announces it will monitor anti-Israel incitement by the PA, including severe libels against Israel and anti-Semitic stereotypes. 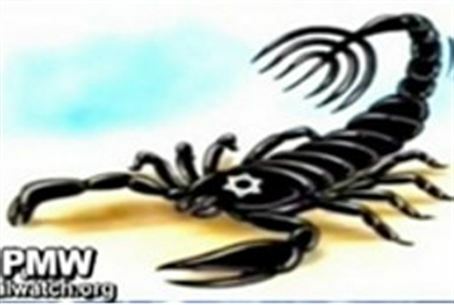 Jews as scorpion in PA press. The Security Cabinet decided Sunday to establish an index that would monitor Palestinian Authority incitement against Israel and the Jewish people. The "Culture of Peace and Incitement Index" was developed by professional Government and security establishment elements. The announcement is linked to the horrific massacre in Itamar, which the government sees as resulting from PA incitement. Vice Prime Minister Moshe Ya'alon said Sunday that continued PA incitement would makes any agreement signed by it worthless. The Index considers four main issues: Explicit incitement to violence, encouraging an atmosphere of violence and terrorism, incitement to hatred and demonization, and the failure to prepare people for positive processes. It was agreed that the Index would be constantly updated and presented in various forums in order to influence the Palestinian Authority to stop its ubiquitous incitement to, and education for, violence. The high-profile establishment of the Index could signal a shift in official Israeli policy vis-a-vis the PA. Israelis who favor appeasing the PA tend to ignore incitement activity, focusing instead on actual terror acts. These are usually not officially authorized by the PA, and are often carried out by groups whose connection to the PA leadership is difficult to prove. Moving the focus to incitement lays the blame for terror directly at the PA's doorstep and could put an end to the terrorist's shell game regarding responsibilty for the actual attacks. The Incitement Index of the last quarter of 2010 indicates a continuation of incitement against Israel in the PA. Familiar patterns of incitement reappeared, including – inter alia – the glorification of terrorists and jihad as part of the national ethos, severe libels against Israel, anti-Semitic stereotypes in the official PA media and the denial of any connection between the Jewish People and its holy places. The Index checks – on a quarterly basis – the PA media, education system curriculum, leaders' remarks, sermons, advertisements on the Internet, basic documents, etc. The examination assesses the relative weight of the foregoing in the incitement and in building a culture of peace. Among the findings revealed were several examples of the extreme demonization of Israelis and the use of anti-Semitic motifs. Prominent among these is a guide for a program on PA television that purports to show methods of torture used by the Israel Prison service, such as burning prisoners with irons and amputating organs.